I happened to take a lot of photos of leaves this Tuesday in the Derwood Demo Garden, so thought I would post them. I’ll start with the cute and end with the sad. 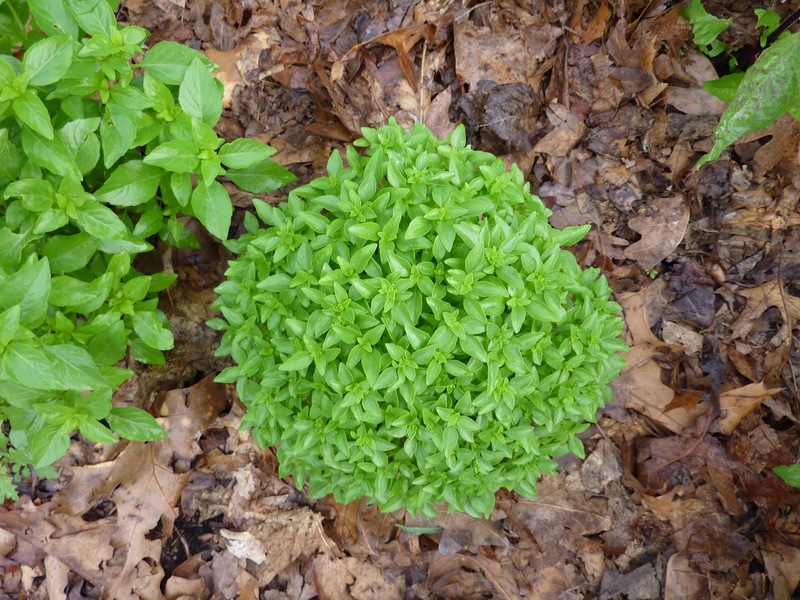 This is basil ‘Spicy Globe’ in our basil patch. It’s a nearly perfect round ball about 6 inches wide, and adorable. 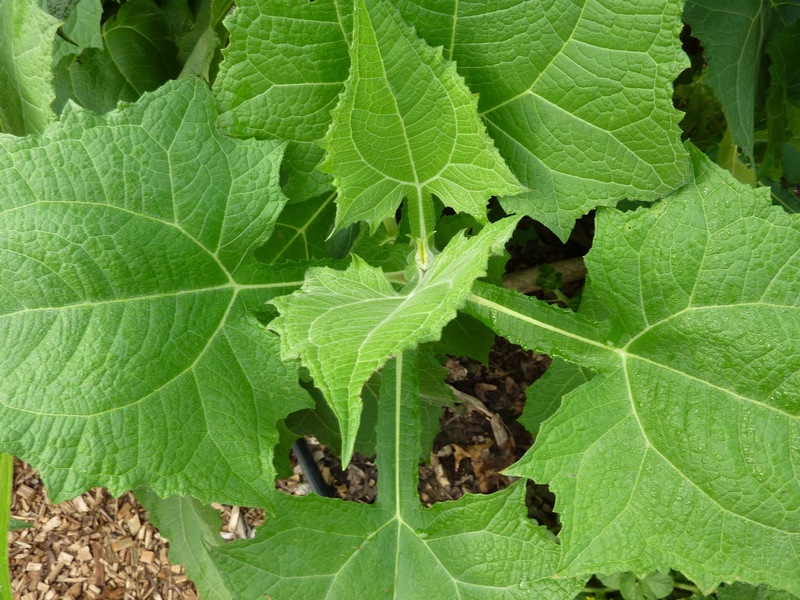 At the other end of the size scale, the yacon patch is producing some 8-inch long leaves that have little or no insect damage. Here are the plants in context. Certainly a striking accent in the garden, about four feet tall. I can’t wait to dig up the juicy tubers in the fall. 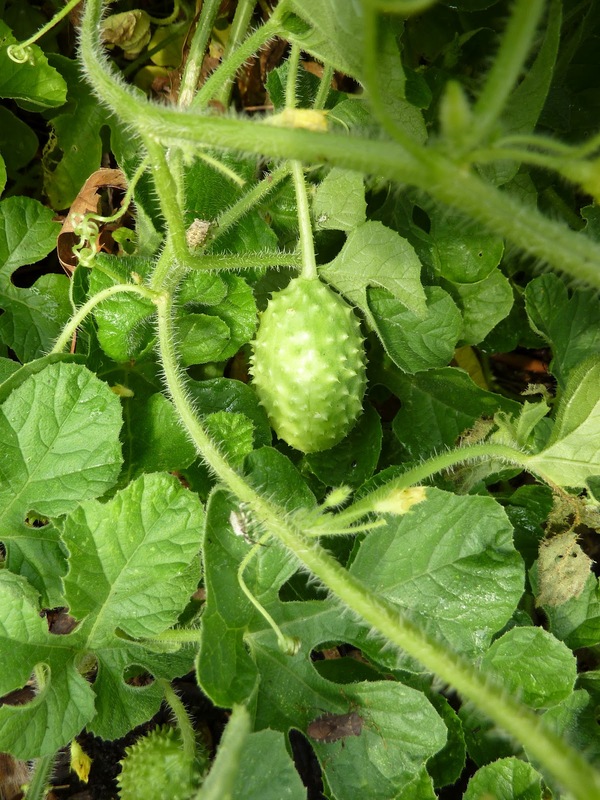 The West India gherkin is growing well up its support and producing lots of these 1 1/2-2 inch spiky fruits that taste like cucumbers. The leaves are very similar to those of watermelon. 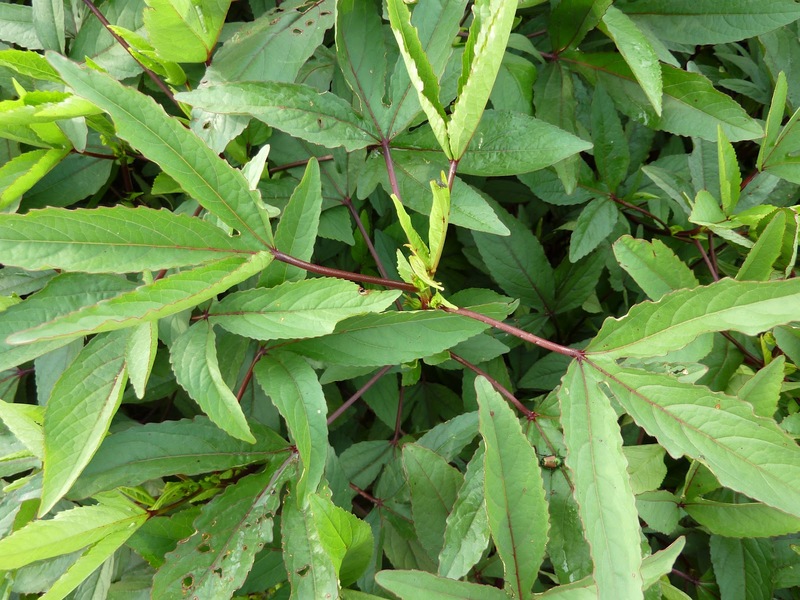 I’ll get around to posting a blog on roselle hibiscus in the fall, and hopefully by then I will have tried eating the leaves (it’s the flower buds I’ve been interested in so far, for drinks). It’s a pretty plant with few insect problems, although we do see Japanese beetles on it sometimes. 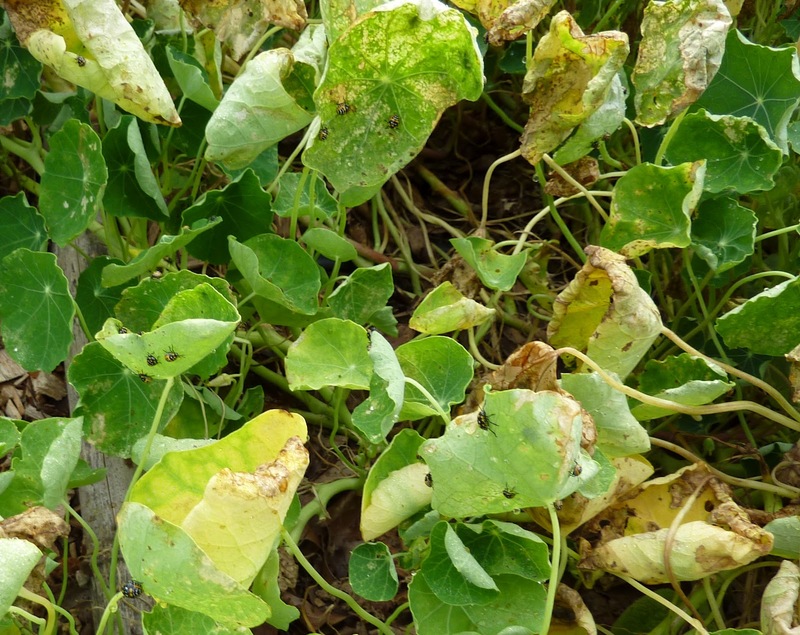 And the sad picture: the nasturtiums we had to pull up because they were infested with harlequin bugs. That’s where they go when all the kale and mustard is finished. Many other leaves are suffering from drought and insect damage too, but at least we have a nice selection of pretty ones left. I planted broccoli, a smooth-leaf kale, and the Tuscan cavolo nero lacinato kale this year. The imported cabbage worms went to town on the broccoli! When I eventually composted them, the little buggers moved over to the smooth-leaf kale and totally decimated it but showed no interest in the dark, rugged leafed cavolo nero. That is, until I composted the smooth-leafed kale to plant more beets. I know it is late for kale to still be producing and I should have composted it long ago. But I think I will keep some of it growing as a trap crop! The harlequin bugs hit our lacinato kale last too. Interesting. We do still have one plant from spring planting, that was shaded earlier by other plants, growing away under row cover. 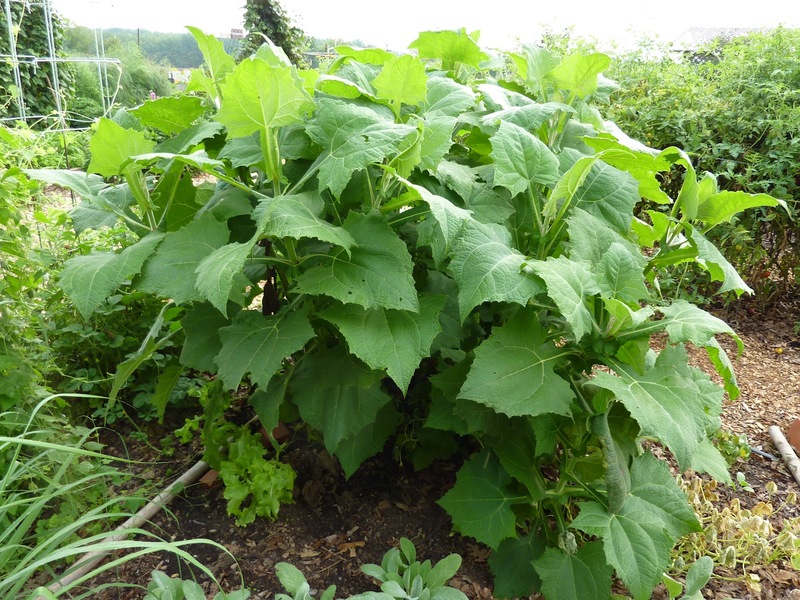 Keep us posted on that yacon – I'm interested in how that tastes and what you do with it! Those leaves sure look unbothered. Hi Wendy – I did taste it last year and posted about it here. We should get a lot more this year!